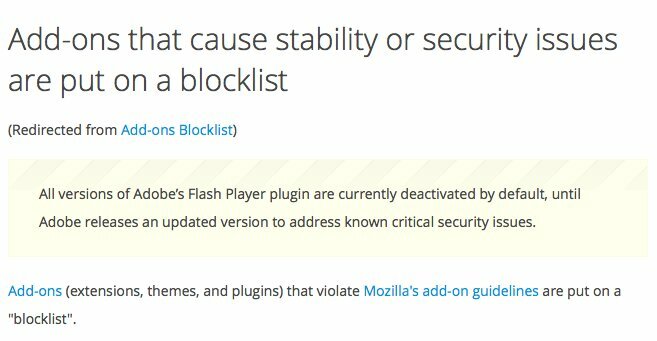 "All versions of Adobe's Flash Player plugin are currently deactivated by default, until Adobe releases an updated version to address known critical security issues," Mozilla wrote in a support document. Firefox currently accounts for around 16 percent of the worldwide browser market. Adobe has been forced to grapple with more than two dozen critical Flash Player security flaws this month, including some that weren't discovered until after they were already being actively exploited. The company has pushed four emergency updates since June 9 alone. Given the scale of the problems, it's not immediately clear when— or even if —Flash will be removed from the list. AppleInsider recommends that Mac users uninstall Flash from their Mac in its entirety and use Google's Chrome browser for any occasional Flash needs that crop up. Failing that, installing the ClickToFlash extension for Safari is a reasonable fallback, and users should always ensure that automatic updates are enabled— the risk of security failure due to an out-of-date Flash version far outweighs the negligible chance of problems with Adobe's update functionality.